Home > Site Launch > How Long Did You Say We Have to Get It Up and Running? How Long Did You Say We Have to Get It Up and Running? Abington Memorial Hospital (AMH) in Abington, PA recently announced the launch of their new Web site (www.abingtonhealth.org). As the Project Manager for the Internet project, I’m pleased with the result and proud that we met our goal and delivered the site in 4.5 months! It was a truly a team effort that could not have been completed without the focus of our development and design staff and the determination of the folks at AMH, Josh Snow and Tom Whitcraft. I don’t think I’ve worked with anyone that could get a response so quickly when they were part of such a large organization. The site looks great, has many new robust features, and lays the groundwork for incorporating even greater functionality in the future. 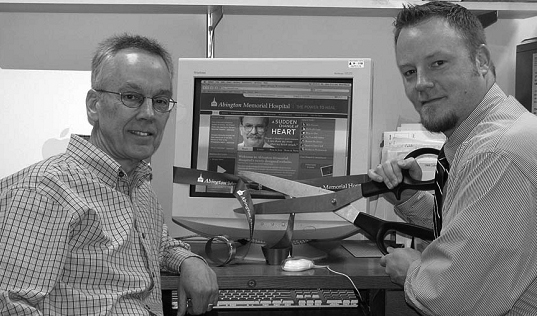 AMH distributed a special edition of their employee eNewsletter, “Abington Trends,” focused solely on the new Web site. I thought the picture of their ‘team’ was great so I included it here. In addition, they plan to do an online scavenger hunt to increase awareness of the site and add some interactivity, all fun things that help the AMH family create a little buzz about their newest creation! This entry was posted in Site Launch by Jill Ungs. Bookmark the permalink. Jill is a list person. She not only gets endorphins from checking things off her lists, but adding things to the list as well.. This makes her the perfect person to manage and mentor Geonetric’s project management and support teams. Her goal is continuous improvement and she brings her resourcefulness and attention to detail to her role as implementation manager. Jill is always looking for ways to standardize processes and make her teams more efficient. She’s also known as the Kickoff Queen, and some of her favorite duties is meeting new clients, establishing project plans and timelines for their projects, and ensuring her team meets every major milestone. 4.5 months! This can easily be a 1 (if not 2) year project. The site looks very impressive. Are there any Project Management lessons you would like to share? How did you manage to finish the project that fast?